"@rihanna no one wants to be your lover so you call everyone and their mother that I almost named my new dog Rihanna." Besides the fact that the second tweet doesn't make sense, the first one is just flat out horrifying. Saying someone is not pretty is rude, but that...that is almost like someone asking a Unicorn to stab them through the heart with its horn. 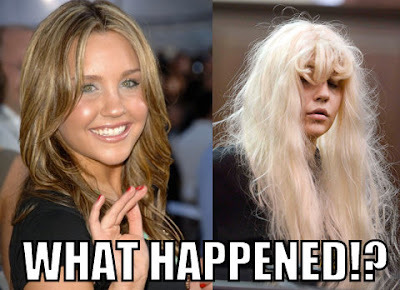 I had hoped, when the manic Britney-like public meltdown started, that Bynes would pull it together and go back to being a normal human, but it looks like the point of no return has been reached. She may have passed it a while ago, but I was in major denial. Major. Besides randomly telling Rhianna that she got abused because she was ugly (the hell? ), Bynes also recently: Got busted for marijuana possession and then said that one of the officers sexually assaulted her when they arrested her. Wore a dollar store wig to court and then tweeted that Nicki Minaj needs to hook her up with her wig person. Got kicked out of her gym for smoking weed in the locker room. Those are just the bigger, headline making stories...that doesn't include the crazy stuff she says on Twitter and the half naked photos that she keeps posting. God help her.